Thar's gold in them thar apple trees. When a rotten apple tree was cut down last week on private property in Davis, scores of eyes peered from the drilled holes. 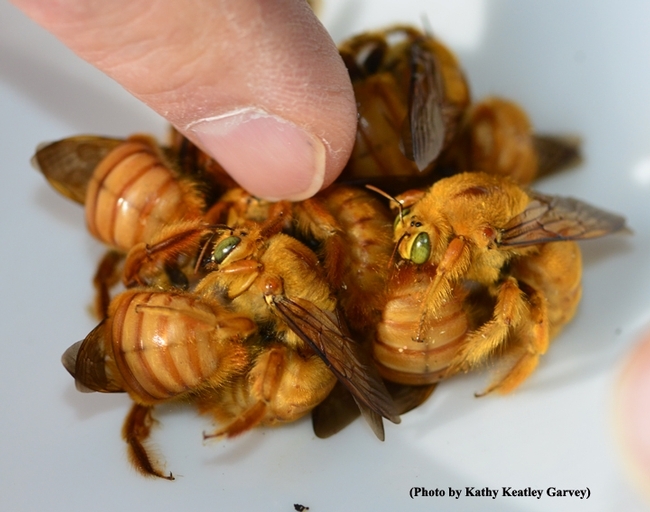 Soon, adult male Valley carpenter bees (Xylocopa varipuncta)--those green-eyed golden bees known as "teddy bears"--emerged with their female counterparts. The males and females look nothing alike; the females are solid black. As entomologists know, the females drill holes in wood to lay their eggs. When the adult females and males emerge from their cells, they "wait it out" until spring or when the weather warms enough for them to take flight. It gets pretty cold in Davis. Photographer Allan Jones go the carpenter-bee call. And yes, the males and females overwinter together. They're unlike honey bees. As fall approaches, the worker bees (females) permanently kick the males (drones) out of the hive, effectively killing them as they're not needed in the winter. Next spring, the queen bee will provide more drones for the colony. Talented insect photographer Allan Jones of Davis got the carpenter-bee call. "My good friend's son, a football player up from Claremont, cut down the rotten apple tree," Jones said. Surprise! Insects began crawling from the drilled holes. Jones knew immediately what they were. He's photographed hundreds of them. 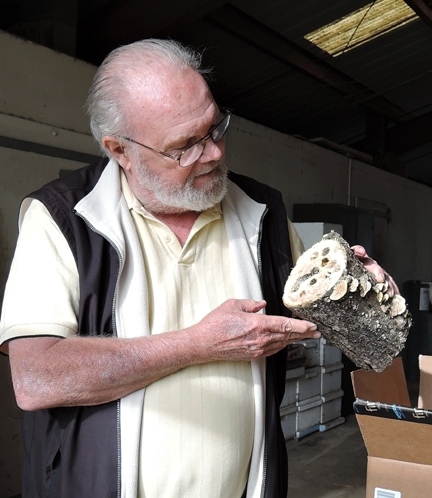 He picked up the golden bees, knowing that "boy bees can't sting" and delivered them to native pollinator specialist Robbin Thorp, emeritus professor of entomology at UC Davis. "The golden boys were all clinging together in a little ball when I left (the Laidlaw facility)," Jones said. 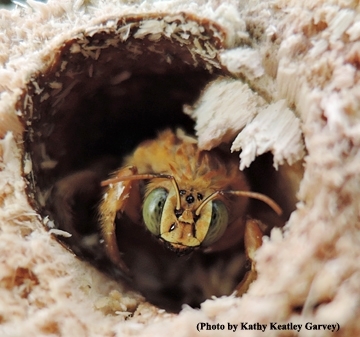 Close-up of male Valley carpenter bee peering from its hole. Thorp plans to keep them chilled to see if they survive the winter. They also will be part of "show and tell" at the Bohart Museum of Entomology's open house from 1 to 4 p.m., Sunday, Jan. 11 in Room 1124 of the Academic Surge Building on Crocker Lane. The male Valley carpenter bees are often mistaken for a new species of bumble bee. In fact, some refer to them as "golden bumble bees." The Valley carpenter bees are the largest carpenter bee in California. They are included in the newly published California Bees and Blooms: A Guide for Gardeners and Naturalists, co-authored by entomologist Gordon Frankie of UC Berkeley, Thorp, entomologist-photographer Rollin Coville and UC Berkeley botanist and curator Barbara Ertter. Xylocopa varipuncta inhabits the Central Valley, Santa Clara Valley, and Southern California. At many garden events, visitors are surprised when Thorp picks up a male Valley carpenter bee and lets them hold it and feel the vibrating buzz. "Boy bees can't sting," he tells them. "They're bluffing." 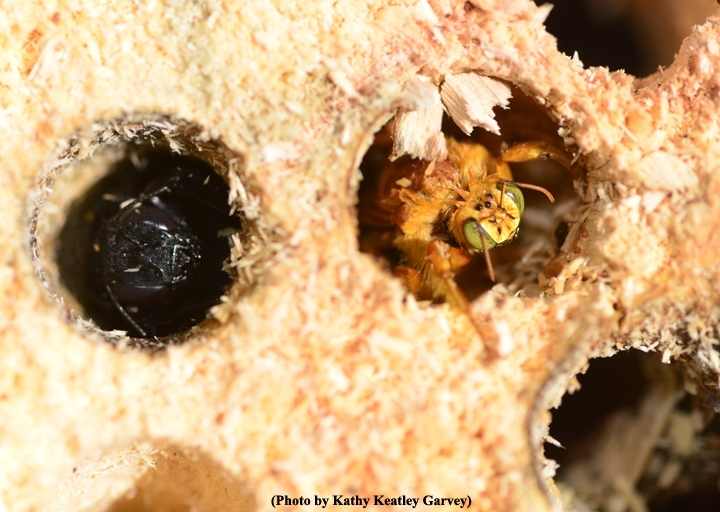 A male Valley carpenter bee (right) peers from a hole. A female (all females are solid black) occupies the hole next to him. A cluster of male Valley carpenter bees. 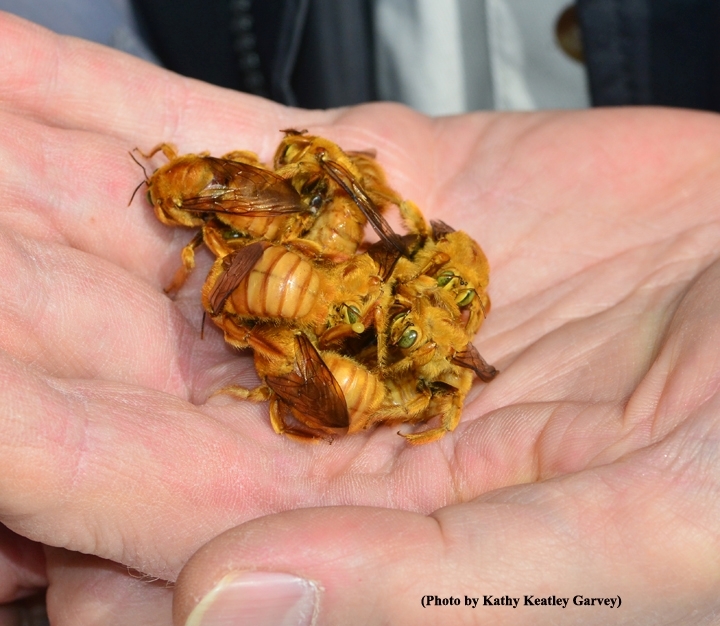 Extension apiculturist (emeritus) Eric Mussen holds a handful of male Valley carpenter bees. This male Valley carpenter bee backed into its drilled hole to keep warm. Fantastic post Kathy! I enjoyed learning about the overwintering habits of carpenter bees. Can you tell me, what are the black "dots" on the top/front of the male carpenter bee heads? Very interesting; love the always beautiful and amazing photos! Every summer I have regular visits from the girls, but have never had the privilege of seeing one of the boys. Is there anything I can do that might attract some of the boys? Thanks, Lynn. Native pollinator specialist Robbin Thorp, emeritus professor of entomology at UC Davis, says the boys are more difficult to find and to see. The boys usually cruise around shrubbery from 3 to 5 p.m., chasing one another and looking for females. He's seen "teddy bear" bees sipping nectar from honeysuckle, salvia (sage) and some of the mints. He recommends you plant some of these flowers. As a native Californian, in 55 years, I had never seen a male Valley Carpenter bee! Yesterday as I walked our dogs & admired our neighbors' gardens, a bumblebee-sounding insect hovered near flowering Hibiscus. He kept up his flight plan for over 15 minutes. Finally, I took our dogs home and came back with a camera. Thankfully, I was able to catch a few shots of this golden fly-boy. Thank you for having an array of images for accurate identification. Beautiful photos. I just photographed a male in my garden. I only see them hover and patrol. I've never seen them in a flower or sitting. I've even had them chase (or it felt like it) in a nursery. Thanks for the info. I'mm a real fan of carpenter bees, and as honey bee remover I get asked very occasionally to rescue/remove them. I was successful in transporting several beams full of females to my yard, where they hang on the side of my garage. I'm adding more beams for them to colonize so I can keep them in the neighborhood. They're really great guests and amazing pollinators, males are flying around at this time of year and I love seeing flying hamsters every once in a while when I go outside. For years I thought the golden colored carpenter bee was the queen. Are the black carpenter bees the females? And what type of carpenter bees are in Hawaii? And how many carpenter bees are there in a hole? Hi, I noticed a big brown bee hovering around our backyard the past few days. After some investigation, it seems that we have a male and female carpenter bee nesting (hole) in one of the branches of our apple tree. The branch doesn't look like it's in good condition. The kids are frightened by the bees; heck they are a bit unnerving for the adults as well. Is it possible to encourage them to leave? Myself, I would encourage them to stay. They're pollinators. "If you are set on encouraging them to leave, you could try encasing the entrances with cones of wire mesh to make it difficult for them to find the entrance hole. Painting the ends of the dead branches will make them less attractive for the bees to initiate new nests. 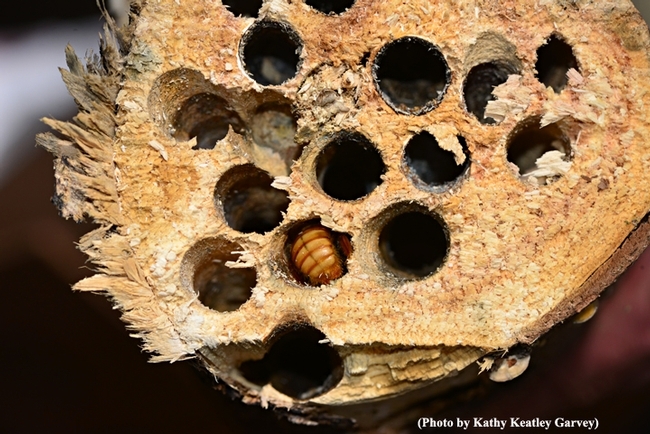 "If there are baby carpenter bees in the nest tunnels, they will continue to emerge over time. "Also prune out the dead apple branches. 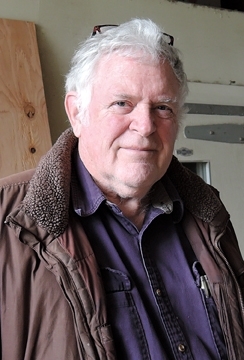 However, a rotting apple tree is an ideal nesting habitat attractive to carpenter bees."